Beer is the most popular summer drink in Canada. Actually, it is the most popular alcoholic beverage in many countries around the world (and not only in summer). Think of Oktoberfest in Germany. It is a festival organized in Munich as a celebration of beer. This is the largest beer festival, but there are others. One is held in Hong Kong! And a beer festival in a Palestinian village on the West Bank attracts tourists from around the world. The locals offer falafels, olive oil, honey, and beer. Among the visitors are NGO workers, diplomats, Israelis, Palestinian politicians, locals, and tourists. The problem is that so far, the festival runs at a loss. Some say that blackmail and corruption are to blame. Others believe that it is because of the cultural gap – the locals are disturbed by alcohol consumption and the presence of women. It may be both. Speaking of grammar, we learn about tenses, adverbs, verbs, morphemes, pronouns, and adjectives at school. And we make little use of this knowledge. “What’s up bro?” “Me bees” and “My bad” are frequently employed. Why do we use slang? It is teens who develop expressions, idioms, and slang to put space between themselves and their parents. Our children are emo. And we also had a generation of drama queens. Today we have words like supersize, brunch, and frenemy. As societies undergo transformations, languages evolve to reflect them. If you hear something like “It just ain’t my bag” and you are past your teen years, “Pardon me” is a normal reaction. And in all likelihood, you didn’t know that awesomity is a word for the highest state of awesome. New words are developed for new activities. And there are combinations of meanings. Languages evolve to reflect new contexts and phenomena. A gold self-directed individual retirement account allows holders to grow their savings by owning precious metals. There are silver and gold rollover IRAs that offer protection against economic recessions, currency fluctuations, and hyperinflation. While gold is a high priced metal, silver is more affordable and therefore more accessible to investors. Wise investors add both silver and gold to their portfolios because the value of precious metals fluctuates. Portfolio diversification is the sought outcome. Of course, there are other vehicles to invest in, including mutual funds, bonds, and stocks. But precious metals consistently outperform other investment instruments. A number of factors help explain the fact that gold prices fluctuate. But the value of gold will increase as long as the world of finance is based on economic uncertainty. And there is an instrument to protect your retirement savings! 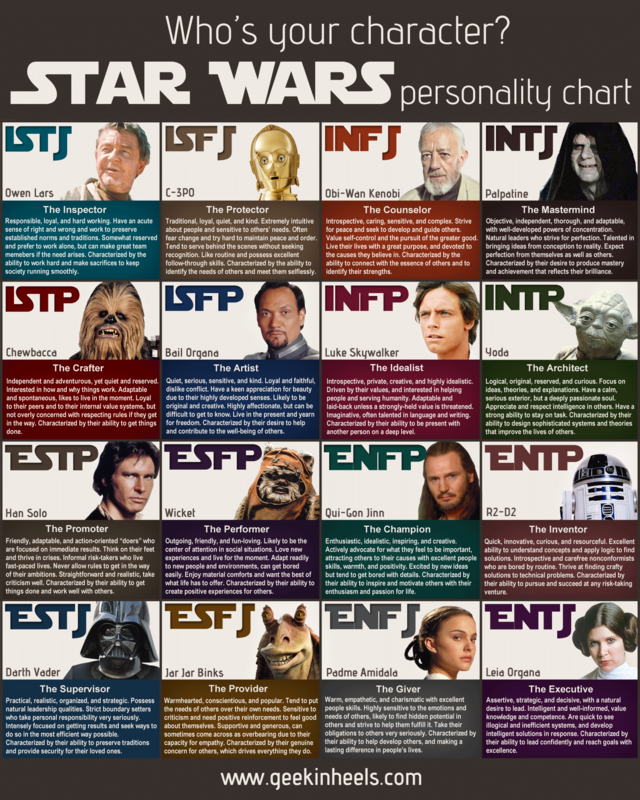 What is your Star Wars’ personality type – the Counselor, Protector, Inspector, Idealist, or Artist? If LSTP, INFP, and INFJ sound familiar, you are probably a psychologist and already know your Myers-Briggs personality type. Your personality is a combination of different traits such as empathy, adaptability, flexibility, discipline, honesty, forgiveness, and others. Some people are generous, focused, and dutiful while others are imaginative, idealistic, and gentle. Our actions, interactions with others, and self-image are shaped by a combination of personality traits. Some traits are beneficial while others are destructive and self-destructive. Think of aggression, low self-esteem, and aloofness. While some traits contribute to personal growth and meaningful interaction with others, other traits make it more difficult to find a partner or be part of a team. Now think of bossy, boastful, bitchy, and arrogant. Or cynical and cruel. But we all have positive traits, don’t we?